Like many other small businesses, the biggest challenge we face is getting as much useful ‘stuff’ done each day. We try to be as productive and efficient as we can – the phrase ‘economy of effort’ gets bandied about our office a lot and something we consider in how we approach a task. Having spoken to many small business owners, we know making the best use of the limited time we have is a common concern. So in the spirit of ‘learning out loud’, we thought we’d share some of the tools and techniques that we’ve found have worked well for us. This is probably our best and biggest ‘hack’. We use a variety of canvasses in the business, all aimed at getting us focussing on an aspect of our business and working collaboratively together to tease this out. We’re big fans of the Business Model Canvas and the Value Proposition Canvas. 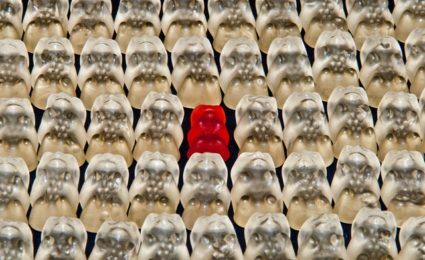 The former is perfect for challenging yourself on some of the assumptions you may have baked into your business inadvertently, as well as spotting new opportunities. The latter often serves up useful reminders of the challenges your clients face and what you can do to resolve these. For more information check out Strategyzer or this book. Get them up in your office and once you’ve had a stab at one of them leave them up so you can let it percolate over time. Revisit them regular if you can. Pro tip: Working collaboratively across your team can help tease out new ideas, challenge assumptions and help your team understand more about your business and brand. If you want to maximise the value of the exercise, work on the canvas together. As Candle Digital grows, things can get hectic when there are various projects to be delivered, all at different stages, with many different people involved. While we use project management software to manage the detail (more on this later) we’ve gone back to basics to keep a ‘helicopter view’ on things. 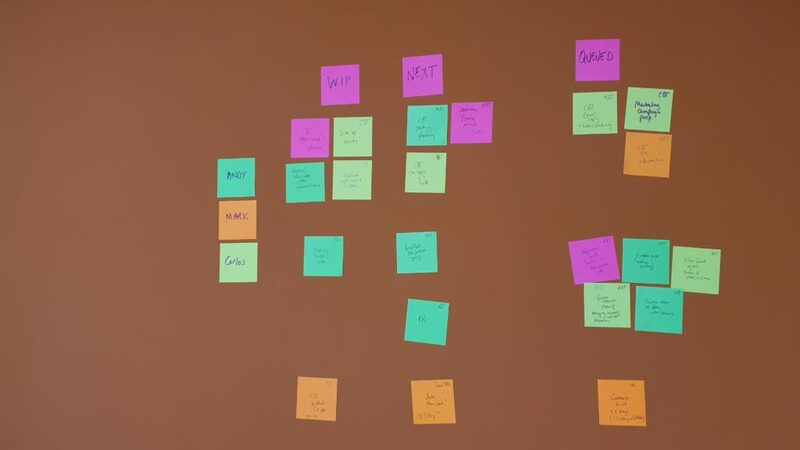 In short, we use static post-it notes, in the loose form of a scrum board. We imagine there are probably plenty of project and product managers screaming at the photo above, but it works for us. We arrange our static-notes into 3 columns: “work in progress”, “next” and “queued”. The columns are divided by who the task belongs to and are reviewed by us all first thing in the morning, to sense check progress, priorities and the overall situation of each project. Pro tip: A short victory dance should be mandatory for whoever has the pleasure of removing a completed task. Magic whiteboard sheets are really convenient and really practical too. Until recently we didn’t know they existed, but are now a staple of our monthly Amazon order. They stick to any flat surface and they are reusable. We use them when brainstorming ideas, or mapping out plans for the next few weeks and months. 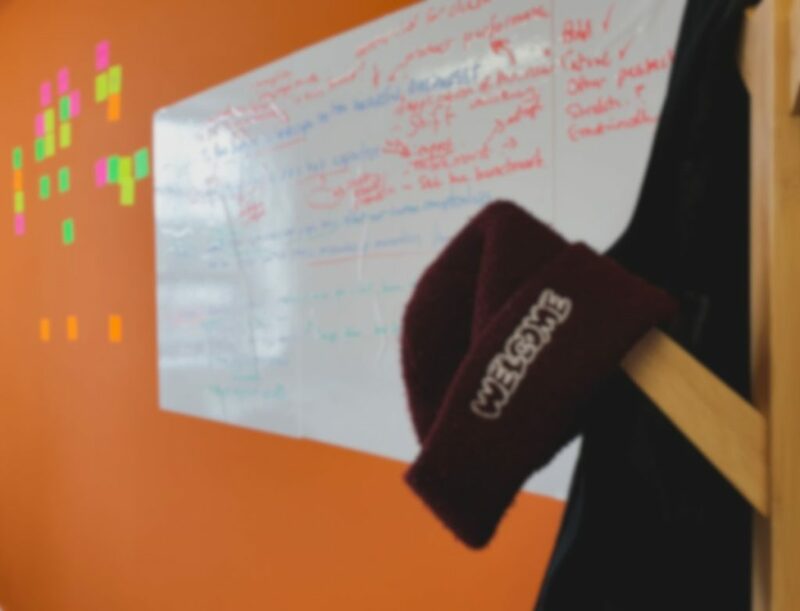 We have them dotted around the office and find the flexibility of being able to move them around, unlike physical whiteboards a real advantage. Pro tip: Don’t forget to have a variety of whiteboard marker colours to hand too! 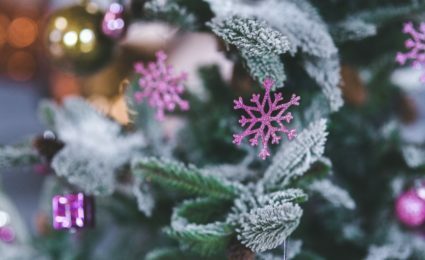 Many of the projects we work on require us to get stuck into real detail, particular when it comes to the technical aspects of refining a learning management system or creating large amounts of learning content. This is where Asana comes in and has been a god-send for us as our business and team have grown. We have tried some other tools such as Zoho projects and Basecamp, but we’ve found Asana more in tune with our way of working. Zoho projects tends to be less flexible than Asana, whereas Basecamp’s simplicity doesn’t give us the detail we crave at times. It allows you to organise as a board or as a list (or as a calendar if you wish), giving us lots of flexibility around our approach to the product. 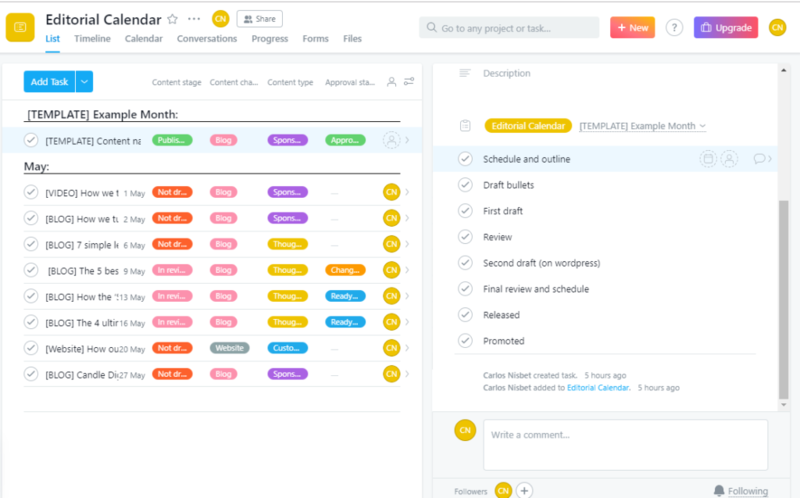 You can attach categories, milestones, content stages and priority tags to each task (to name a few). You can also give your clients access so that they can see how the project is progressing and highlight where you might need their input. Pro tip: We’ve found Asana’s templates really helpful to manage our marketing activities alongside delivery of our projects. The content calendar is particularly useful for this! The Slack interface is very simple to use. And last, but certainly not least, is Slack; the colleague-communication platform that we simply could not function without. 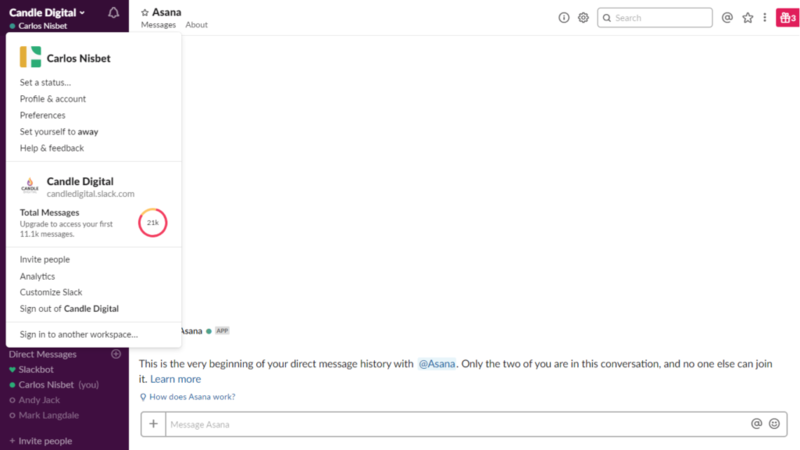 Slack has become an integral part of our communication as a business. The ability to create threads and keep all of your various conversations organised into separate categories is particularly useful. We’ve found that Slack has completely replaced email internally and helped us avoid getting lost in the endless vacuum of internal-email-labyrinths! Pro tip: We’re big believers in not taking our work home with us, so while the mobile app is really useful in staying in touch do be sure to specify ‘do not disturb‘ hours in the evenings. We’re still very much learning, adapting and trying to find which methods work best for us. So far these 5 tools have really helped us stay organised. Give them a try for yourself and see how you get on. If you have any productivity tips yourself, let us know on Twitter!